Nuclear fusion has the potential to be an energy source that powers society without generating greenhouse gases or high-level radioactive waste. 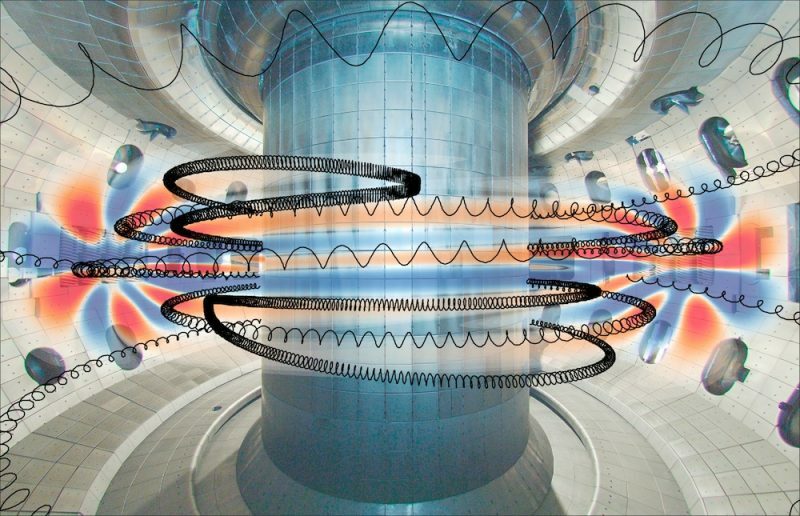 The tokamak approach to controlled nuclear fusion employs a toroidally-shaped magnetic field configuration to confine plasmas at temperatures beyond 200 million K (20 keV). Future reactors aim to utilize the deuterium-tritium fusion reaction due to its favorable cross-section, where this DT reaction produces a 14 MeV neutron and a 3.5 MeV alpha particle. While the neutron is collected by the surrounding structure to allow for energy extraction, the alpha particle must be confined such that it transfers its energy to plasma, thereby maintaining fusion temperatures. This self-heated scenario is known as a burning plasma state. The fusion- alpha population is suprathermal, however, and is therefore able to excite plasma instabilities (e.g., Alfven eigenmodes) that cause detrimental alpha transport and reduce fusion power output. Existing tokamaks study these phenomena using energetic ion populations produced by auxiliary heating with particle beams or injected radio- frequency waves. The fundamentals of Alfven eigenmodes will be presented, along with the advanced diagnostics and theoretical treatments applied to the study of energetic ion transport and losses in modern tokamaks. A thorough understanding of this physics is essential for the ITER tokamak, an international reactor designed to output 500 MW of fusion power requiring control of its unique energetic ion population consisting of both alpha particles and 1 MeV injected beam ions.